Located in the Hengduan Mountains, in close proximity to the Tibetan Autonomous Region, the villages surrounding Kathok Monastery are known for having a high concentration of artisans. With their family lineages linked to the need for artisans to build and embellish the monastery over eight centuries ago, the families living in the region are known for their painting, carving, woodworking, and preeminently for knife making. 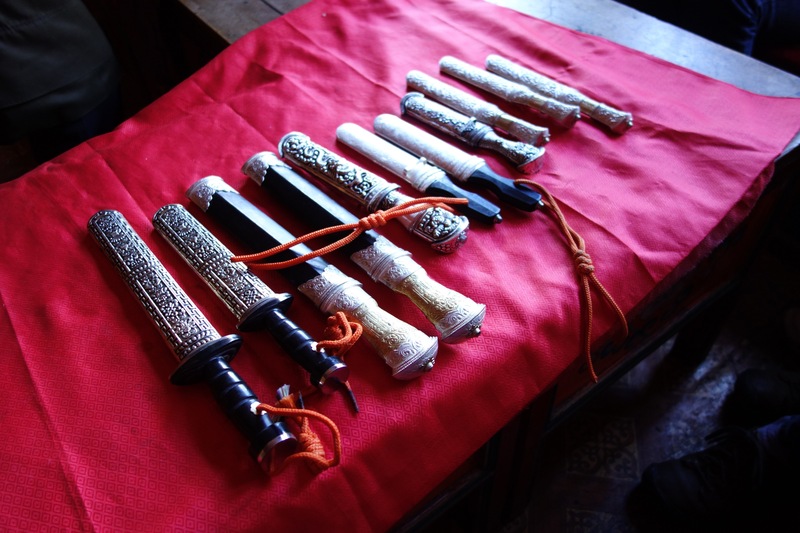 These knives, linked to the armaments of the 12th century ge sar rgyal po, or King Gesar, are prized across Tibet for their exquisite and intricate designs coupled with the uniqueness of their hand wrought character. Knives may be around a yard, a foot and a half, or 4 inches in length. Knives are used in the daily tasks associated with butchering, farming and herding, as well as for preparing bodies for bya gtor or sky burial.